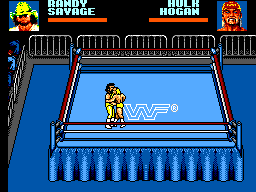 Accept the toughest challenge in all of wrestling as you choose from ten of the meanest wrestlers around including all of your favorites from the early 90's.It seems that everybody was a big wrestling fan around the time when this game was released and personally I used to actually enjoy a game on WWF royal rumble. The gameplay is simple enough alternately press buttons one and two as fast as possible so that you punch and kick your opponent into submission.The trouble is the gameplay doesn't really involve wrestling holds and technical moves so it isn't an exciting game at all.In fact seeing as it's a wrestling game the moves are extremely limited with the characters having no trademark moves or there own characteristics just punch,kick and bodyslam,not even a suplex or piledriver in there.The game does have a good amount of options,you can choose from a regular match or steel cage match,challenge for the WWF title or go for the tag team titles. Graphically this game is fairly good with the characters and ring looking realistic enough, however if you opt for a tag team match then the game slows down tremendously. 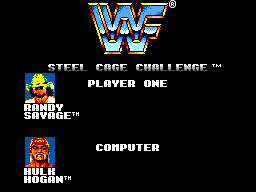 Each character has his own trademark theme music playing when selecting who to choose from which sounds close enough to the real thing,well as close as you'll ever get on the SMS anyway.There isn't any music in the game but I think the sound effects are good and music in a wrestling game isn't a necessity. The controls are not very good in a one player game but in a two player game it slows down allot making it even worse, so to throw a punch or kick it may take a second or so more.The controls may also give you grief when trying to pin or grapple. 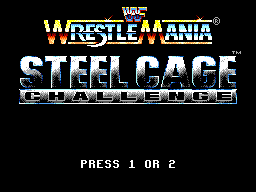 This game is boring to say the least and it's also very easy.If it had more wrestling moves to perform it could have more lasting appeal.In a one player game you'll win the title then never play it again and in a two player game the slow down just ruins the game. This game is about punching and kicking not wrestling.It is even worse than most wrestling games, with very few moves and no appeal even to wrestling fans.If you're after a wrestling game try Pro wrestling as this has more individual moves and is fun to play once in a while.This game is about as fun as watching Hulk Hogan and his bad acting wrestle Ric Flair in a special pensioners match.